On Friday, November 29, as Americans chose between sleeping off Thanksgiving turkey and shopping at dawn for electronic and clothing bargains, another big factory fire burned in Bangladesh. 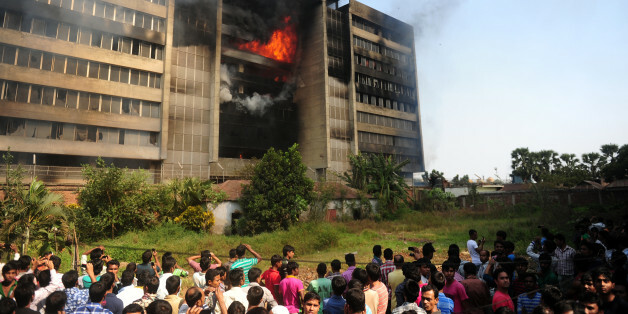 At first glance, it seems a horribly familiar story line: one of the largest garment factories in Bangladesh -- employing perhaps 18,000 workers -- burnt down. This follows the tragic Rana Plaza collapse that killed more than 1,100 workers in April, and the Tazreen fire that killed 112 in November. As a recent report by the International Labor Rights Forum documented (and for full disclosure, to which I contributed), Bangladesh has been a careless inferno of workers' lives over the last 20 years. The fires and deaths are not just accidents. They are a byproduct of Bangladesh becoming the second largest world exporter of garments and the world's lowest cost provider. Worker safety has been sacrificed to cheap production. Nevertheless, this time, the first glance is more than a bit misleading. It appears from international news reports that the Standard Group factory in Gazipur, 25 miles from the capital, Dhaka, was set ablaze by angry workers. There were no casualties as the nine-story building was destroyed while it was closed. According to early reports, workers had been provoked by an announcement at a local mosque that a worker had been killed in a confrontation with police the day before. While officials have denied that a worker was killed by police, the context should be understood: Bangladeshi garment workers have consistently faced hostility from their government and from police when they have attempted to increase their pay. Last year, one of their labor leaders was tortured, then murdered by what many Western observers believe were state security agents. Bangladesh's rise to prominence in the world rag trade has been built on the backs of the most exploited garment workers in the world. Their recent agitation for a doubling of the minimum wage would leave them still the lowest paid garment workers in the world! Conscientious shoppers in the Western world -- a small, but influential market segment -- often feel they are leading the ethical parade. The burning of a factory by outraged workers reminds us of another part of the story: working people are the best, first and last guarantors of their own rights. The Standard Group factory fire may not be an ideal path to change, but it is clear that no deaths resulting from worker anger is preferable to more than 1,100 deaths from employer negligence. The Bangladesh Accord on Worker Safety has charted the path to positive change in Bangladesh and in the world garment business. The path-breaking agreement is not "voluntary" once a firm signs the contract. Worker participation, firm responsibility, and the rule of law are all embedded in this precedential agreement. More than 100 firms have signed on to it, including the American signers PVH Corp. (including their brands), Sean John, and Abercrombie & Fitch. The bulk of the participants are European firms, including the world's second largest retailer, the Swedish firm H&M. Alas, the North American giants Gap and Walmart are refusing to make the firm commitments required by the Accord and have formed their own, competing "Alliance for Worker Safety," which excludes worker representatives. Exclusion of workers' participation in safety preparations and disrespect for their rights of association does have consequences. Sometimes that consequence is horrible loss of life through neglect, and sometimes it's an act of rage. Robert J.S. Ross is professor of sociology and director of the International Studies Stream at Clark University. Author of "Slaves to Fashion: Poverty and Abuse in the New Sweatshops," Ross is a member of the Board of Directors of the Sweatfree Purchasing Consortium. Ross can be reached at rjsross@clarku.edu or via phone at 508-793-7376.